As our Glass Adapters are also used as Filling Funnels we made some special ones with a higher volume of approx. 90-100 g coffee beans. 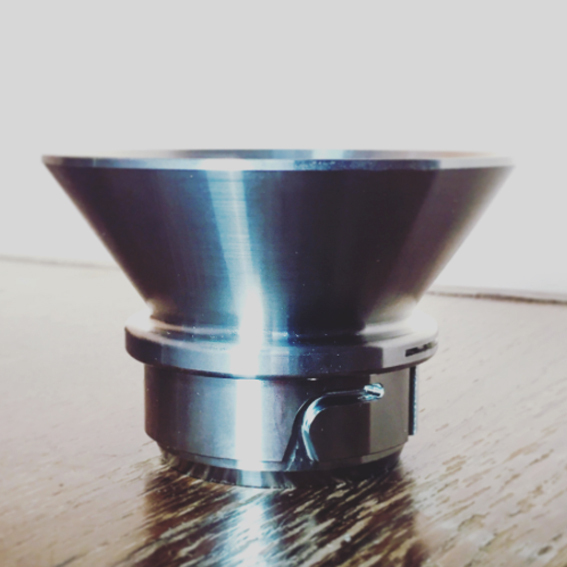 We started with the funnel for MK where single dosing is very popular with the Mahlkönig EK43 Grinder. We will produce big Filling Funnels also for other grinder models and also on demand. Different finishes available on demand. These first models are made from stainless steel, we expect them to be made from anodized aluminium in the future as for the high prices, a result of big diameters we need. The top diameter is ø 115 mm and it´s made of one single piece of stainless steel.